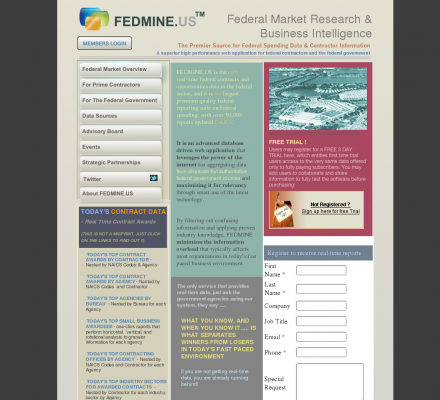 FedMine - Federal Market Research & Business Intelligence - FedMine. FedMine.us is the only real-time federal contracts and opportunities data in the federal sector, and it is the largest premium quality federal reporting suite on federal spending, with over 50,000 reports updated DAILY. Ashok did try to throw in the towel on many occasions on the way to final product launch in the summer of 2007, but each time he found himself further along the Rubicon that he had crossed a long time ago. Description: Ashok did try to throw in the towel on many occasions on the way to final product launch in the summer of 2007, but each time he found himself further along the Rubicon that he had crossed a long time ago.